Steve Rude is an incredibly versatile artist, and it shows in this book. There are over 300 illustrations and more than three dozen photos in this book. It's also one of the better art-book/biography book. 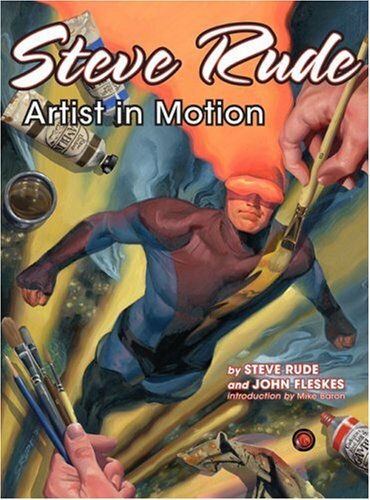 The text is really in depth and gives a clear understanding of Steve Rude's life, and career. The book leads off with an introduction by Mike Baron who talks about how they met and their working relationship. Then there are 14 pages of interviews with the Dude himself. After which Steve talks about his influences and what got him into art. The rest of the book is his amazing collection of work. There are commission pieces, sketches, line drawings, fine art, Nexus comic covers and animation. He uses a lot of medium, after a while you'll lose count. Every illustration is captioned by Steve Rude himself. Every piece has a story to tell. This book is an impressive showcase of his work and talent, and a wonderful read.